Vehicle sales are rising, but declining volume over the past two years made indirect lending a crucial source of auto loan growth. As the economy slid into the earliest parts of the "Great Recession," the automotive industry was one of the hardest hit market segments. In 2008, total vehicle sales fell 18% from the previous year. As the unrest in the general market continued, vehicle sales slid further, declining an additional 21% in 2009, the lowest sales volume reported in nearly 30 years. However, as the economy recovers, so too does the auto market. Through the first quarter of 2010, vehicle sales have increased more than 15% on a year-to-date basis. Both foreign and domestic automakers have ramped up their incentive programs in the past few months. As vehicle sales are on the rise, so too is the demand for vehicle loans, creating an opportunity for credit unions to capture this business. Even with vehicle sales on the rise, credit unions are struggling to convert sales into loans. Final numbers on credit union auto loan volume during this period are not available until next month, but a look at market share trends shows credit union market share has slipped in early 2010. Credit unions captured 20% of the auto loan market in 2009, but market share figures for the first two months of 2010 show credit unions holding just 15.2% of the market. Many larger banks are returning to the market, and many dealer incentives come in the form of 0% financing. These incentives are helpful in driving an increase in sales volume but create a difficult scenario for credit unions, especially the 0% financing offered through the foreign automakers, as they have traditionally maintained a strong relationship between their dealers and captive financing. But credit unions aren't giving this market share up without a fight. In addition to modifying their loan offerings to meet member needs, running recapture programs to get members into better loans, and working with younger members, credit unions have also ramped up their dealer relationships and put a renewed focus on the indirect channel. In order to combat the returning captive financers, credit unions are making their presence felt at the dealerships, and the number of credit unions that offer indirect lending to their members is increasing. 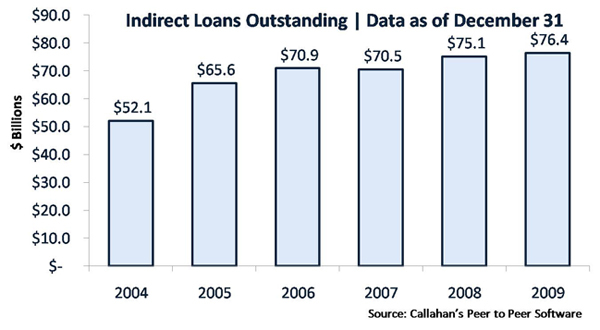 Through the end of 2009, credit unions reported $76.4 billion in indirect loans on their balance sheets. This represents not only a record high volume of indirect loans for credit unions, but also an 8.4% increase in balances over the past two years. This is strong growth for a period where vehicle sales declined rapidly and total auto loan balances were down 2.2%. Indirect balances continued to grow, and now represent 43.6% of the total auto loan portfolio, another record high. These figures illustrate the success credit unions have had in the auto market over the past two years as they found new opportunities in the pullback of the banks and captives from the market. When vehicle sales slumped and the economy saw a downturn, many larger banks and captive financers left the market. According to the Federal Reserve Board's "Senior Loan Officer Opinion Survey" from July of 2008, more than 67% of banks surveyed reported they were tightening standards for their "Non-Credit Card Consumer Loans." However, the survey's most recent data from January 2010 shows the percentage of banks that are still tightening standards has fallen to 1.9%. Although this doesn't necessarily mean banks are relaxing their consumer lending standards, you can see by this dramatic shift that credit is no longer as difficult for consumers to get as it was 18 months ago. Competition is back in the auto lending market, and credit unions need to remain proactive to drive balances into the institution and avoid losing ground on the record market share captured in 2009. Although indirect lending remains a crucial component of many credit unions' auto lending strategies, credit unions still need to take advantage of other strategies to re-introduce growth to this struggling segment of the loan portfolio. If you're looking new ideas to supplement your current offerings, check out our webinar, " 10 for '10: Key Auto Loan Growth Strategies for a New Decade," now available On-Demand on CUtv. Having been in the indirect business for over 30 years I believe it has evolved into a program that I can no longer support for my credit union. Please see article in the April 7, 2010 Credit Union Times entitled "Is Indirect Lending a Romp In the Devil's Playground? I support Mr. Siegrist thoughts.